"Together We Create A Special Neighborhood!" 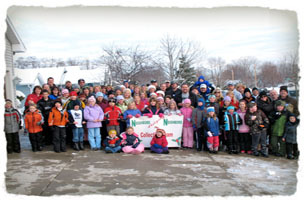 Seventeen years ago, a group of families from our subdivision decided to do something charitable during the holidays. A monetary contribution was made to the Food Pantry in Waukesha. When we arrived at the Food Pantry, the line was out the door and the parking lot was full. We all were touched by the sight. Since then, we expanded our team and efforts. Over the years, we collected $59,961 and 43.95 Tons of food from our neighborhood donations! THANK YOU: Thank you to all our neighbors who graciously donated to this year's food drive. We are happy and proud to live in such generous neighborhoods. A special thank you to all families who volunteered their time and effort to help make this year's food drive a HUGE success! THIS YEAR'S TOTALS: We are happy to announce this year's Food Drive totals for both Food/Household items donations. Here are the latest totals (as of 12-13-18). Great job Neighbors! HOW YOU CAN STILL HELP? By making a food or financial donation to the Food Pantry of Waukesha County. There isn't just a need during the holidays, unfortunately, hunger is is present year round. 2018 Food Drive Pictures - Pictures and slide show from this year's food drive and post celebration - Watch It Now! Thank you for your support of the Food Pantry of Waukesha County. izations that have gone out of their way to help make our Food Drive a successful one.